Is it worth considering Official Rating (OR) when betting on horses? The OR Myth: Is Backing Top Rated Horses Asking for Trouble? As an estimated 60% of UK horse races are handicap affairs, the BHA’s team of handicappers have their work cut out to assess each entry properly. The purpose of handicap racing is to ensure races are a competitive affair. Without this system, 99% of trainers would be out of business because only a handful of them would own horses capable of winning races. The Class rating system ensures horses of a reasonably even standard are in each race. It would be some sight to witness a Class 5 horse racing against Class 1 superstars with the latter carrying an extra 50 pounds! Each horse is given an Official Rating (OR) which is the basis for the ‘handicap’ they must carry. A horse with an OR of 88 will carry 10 pounds more than a horse with an OR of 78 in certain races for example. As a result, the horse with the best OR in each race is deemed to be the best overall and it is only natural for punters to gravitate towards them. However, these horses also carry the most weight (take note of allowances for novice jockeys) so now, it is a question of whether the handicapping team has got it right. 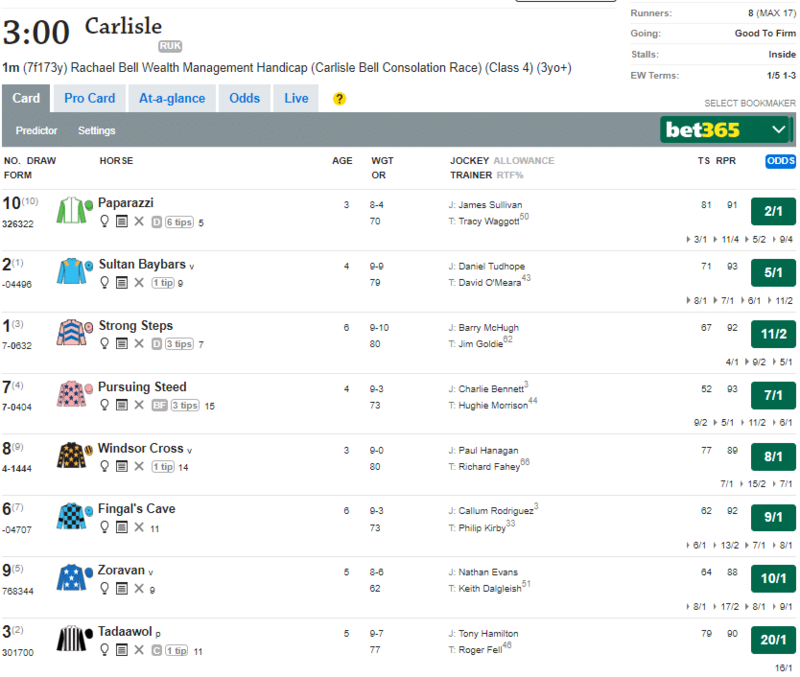 In this screenshot from the Racing Post website, you can see that the two top-rated horses, Windsor Cross and Strong Steps are NOT the favourites. In fact, the horse with the second lowest rating, Paparazzi, is the favourite. If you check out the weights, you’ll see that Paparazzi carries 10 pounds less than Windsor Cross and a whopping 20 pounds less than Strong Steps. On the other hand, perhaps it is a mistake to dismiss top-rated horses just because they carry a little extra. In theory, their extra class can help them pull through in less than ideal conditions. The best way for us to learn more is to dig deep into the statistics. For this article, all data is from January 2014 onward unless otherwise stated; and also focuses on horses that are clearly the top-rated horse; unlike the example above where two horses had the joint highest OR. The obvious first step is to look at the overall performance of all top-rated horses and as you can see, there are a lot of possible bets. That’s a pretty brutal outcome as only 16% of them win and you would suffer a 2,181 unit loss on Betfair! For the record, All-Weather is the least-worst option with a loss of 5.35% while National Hunt provides the poorest result with a loss of 11.47%. One would expect clear favourites to perform better and they do, but only marginally. It is still a bad result. In terms of code, AW yields a loss of 2.68%, loss on National Hunt is 7.19% and Flat is the worst option with a loss of 9.61%. When it came to dividing races into Class, I found a good laying opportunity on Class 2 races. Since almost 88% of clearly top-rated horses fail to win their Class 2 race, it is obvious that laying is the way to go. Doing so would yield a profit of 8.72% including profit in four of the five years. Class 4 races provide the best opportunity but even then, you’re still losing 3.66%. It is only when you narrow it down to Flat events that we see a small semblance of profit at 1.88%. To be fair, Flat races have provided a reasonable opportunity with 4.2% or more profit in four of the last five years. Only the 12% loss sustained in 2017 is dragging us down. Even so, it is hard to find any decent trends supporting the notion of backing top-rated horses, even favourites, in handicap races. There are also opportunities to back top-rated horses in non-handicap events and in theory, they should win far more races. If you look at top-rated favourites, you’ll see that this is the case. Almost half of top-rated favourites win their non-handicap races, a full 17% more than their handicap equivalent but bookmakers are no fools. The odds on such horses are usually far shorter which is why you still sustain a minor loss. Strangely enough, losses are fairly consistent over the three race codes with no clear benefit or detriment to focusing on any of them. It is best to look at lower grade non-handicap races. 52.12% of top-rated favourites win in Class 4, 5 and 6 events although you still sustain a loss of 0.84%. When you focus on National Hunt races only, you earn a slight profit of 0.72% with an impressive win rate of 55.2%. I had hoped to find some trends and data to support the idea of backing top-rated horses but unfortunately, it eluded me on this occasion. It is crystal clear that you’ll be left chasing your tail if you believe it is possible to outsmart the BHA’s handicapping team. These individuals have decades of experience and their extraordinary level of knowledge ensures that British handicap racing is amongst the most exciting in the world. This is of course bad news for the punter! Non-handicap events throw up far more options with win rates of above 50% amongst top-rated favourites the norm. Alas, bookmakers know this better than anyone and set their odds accordingly. Therefore, it is not possible to either promote or condemn the backing of top-rated horses. For non-handicap races in particular, you should analyse the top-rated horse’s recent form and view trends from the specific race if possible. 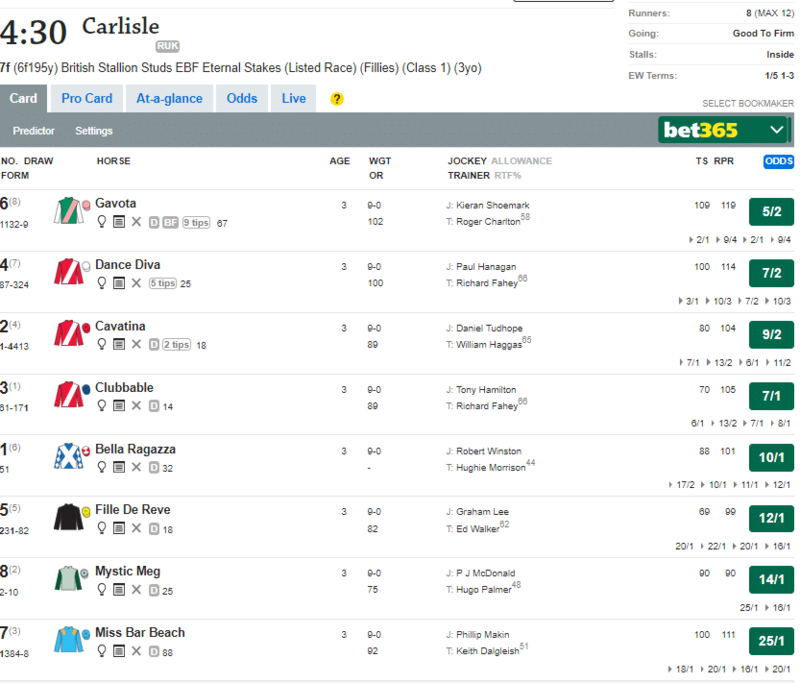 In this non-handicap race, Gavota is top-rated and the favourite but finished ninth in her last race. Dance Diva is in better form and meets more race trends so do you back the top-rated horse or the second favourite that’s only two OR points behind? For the record, Dance Diva won the race.